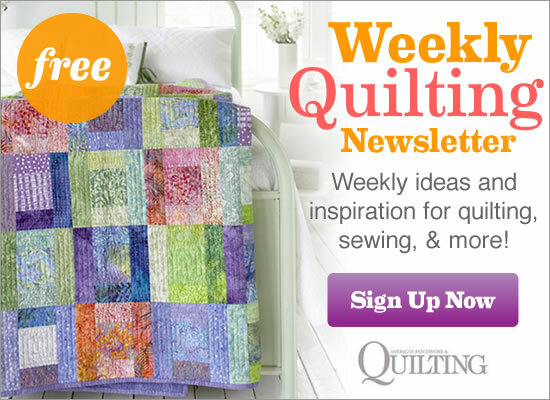 Whip up a quilt in no time with these quick and easy quilt patterns. Perfect for last-minute gifts or a one-hour quilt to use up your scraps, these quilts are so easy, you might want to make one of each! Capitalize on eye-catching prints for an oversize throw with a quick-to-piece symmetrical arrangement of large fabric cuts and a coordinating pillowcase. Here's a two-block treat that's great for beginners. A mix of squares and rectangles, this geometric beauty proves that sometimes simple is best. For a throw with maximum impact made in a minimum amount of time, try this quilt made of 8-1/2" squares. The key to achieving the stair-step look is cutting the 2-1/2"-wide strips different lengths. The black-and-white prints allow the red squares to pop off the wall hanging. Plaids in happy, bright colors form a whimsical quilt. Though the plaids give the throw a complex look, it is simply rows of rectangles in five sizes sewn together in a random order. Custom cover your comforter by turning a pieced quilt top into a "summer weight" quilt by finishing it as a duvet cover instead of layering it with batting. Three vertical rows of pieced graphic prints combine to make an impactful wall hanging. Turn precut 10" squares into a quilted throw. This easy project could be pieced overnight to give as a gift tomorrow. Delicious sherbert-tone batiks are the foundation in this quick-to-sew quilt. Surround a simple square with four mix-and-match rectangles and voila—one block is done. This super-simple quilt uses muted colors making it a cozy fit for any season. Have large prints you don't want to cut into smaller pieces? Try this quilt, where bold botanical prints are perfectly showcased in 18" squares. Precut strips make up the simplified blocks in a throw. Two borders in different batiks round out the quilt. Stitch an easy-to-sew quilt using a variety of precut 2-1/2"-wide strips. Combine triangle-squares with larger rectangles of your favorite fabrics for an easy wall hanging. Trim precut 2-1/2" strips into rectangles to piece bright blocks that can easily be assembled into a cheerful table runner. Each block of this sizzling, south-of-the-border throw uses nine assorted stripe, plaid, and solid fabrics. Showcase colorful fabrics in a cheerful, contemporary wall hanging. Include blocks made with pairs of tone-on-tone prints to add interest to the overall design. This pint-size quilt is perfect for a baby quilt or for a toddler to cuddle up with on a spring day. The large unpieced squares in this table runner are perfect for featuring a large novelty print. Make a scrappy yet orderly quilt using aqua, lime, and cocoa print fat quarters. Bold florals, prints, and stripes combine to give a simple quilt dazzling eye appeal. Make a cheerful summer throw of cleverly arranged Rail Fence blocks. Create a simple wall hanging by carefully arranging squares and triangle-squares. Cut 5" squares for colored rectangles that stand out agains a neutral background fabric. Assorted prints cut into rectangles and sewn into strips form a cowboy-inspired throw.